The Guildhall and Guildford House in Surrey will be illuminated green from 5pm onwards on Monday 3 December in support of the NSPCC's Christmas appeal. The iconic landmarks will be lit in the charity’s distinctive colour to help raise awareness of the charity’s ‘Light For Every Childhood’ campaign, which aims to shine a light on children experiencing neglect at Christmas and all year round. Neglect happens when parents and carers can’t or won’t meet a child’s needs. Sometimes this is because they don't have the skills or support needed, and sometimes it is due to other problems such as mental health issues, drug and alcohol problems or poverty. It costs the NSPCC’s helpline £5 to answer a call. By making a donation the people of Surrey can help the charity answer more calls and shine a light on a child who is being neglected and get them the help they so desperately need. Adults worried about a child’s welfare can call the NSPCC’s Helpline 24/7 on 0808 800 5000. 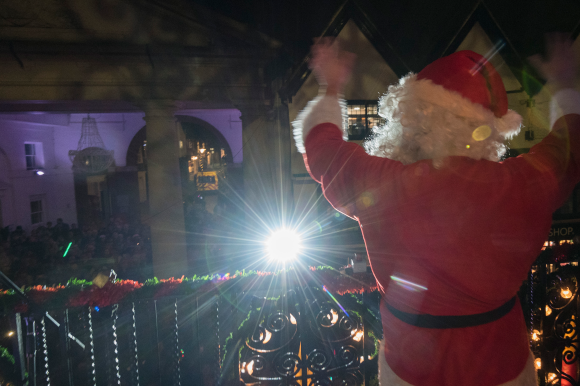 The mood was right and the spirits were most definitely up at Guildford's annual Christmas Lights Switch-On event in the historic High Street last week. The town centre was filled with Christmas entertainment for all the family from the afternoon until late at the event organised by Guildford Borough Council, together with partners Experience Guildford, GEE YOU, Guildford Fringe Theatre Company, Eagle Radio, White Lion Walk and the Yvonne Arnaud Theatre. An exciting balcony show hosted by Eagle Breakfast DJ Peter Gordon with guests including Mayor of Guildford Cllr Mike Parsons, local sports stars and the cast of the Yvonne Arnaud pantomime including actress and singer Michelle Gayle, preceded the lights switch-on and the fantastic firework finale was kindly provided by Steve Cotney of White Lion Walk. Guildford MP Anne Milton, Minister of State for Apprenticeships and Skills also attended the event and describes it as a "wonderful evening". He explains: “Each year we try to improve on the last and this year we were able to offer even more entertainment than previous years and new dedicated quiet spaces for those who prefer to avoid the hustle and bustle of the High Street. We worked with Social Change Company GEEYOU to offer this service with grateful thanks to Skipton Building Society and Cosy Club in Tunsgate Quarter." Nick White, Director of GEEYOU explains: "Making the Guildford Lights event as accessible as possible was one of our top priorities this year. We ensured we provided a safe and comfortable environment and were able to welcome everyone who made an equiries. The work of our staff and volunteers ensured our Quiet Spaces were a tremendous success." Evergreen Road play area in Frimley is the latest playground to be refurbished as part of SHBC’s £650,0000 play area improvement programme. Surrey Heath Safeguarding and Support Portfolio Holder and Parkside ward councillor Cllr Josephine Hawkins officially opened the playground with SHBC Executive Head of Business Daniel Harrison and Senior Business Officer Nicky Sherlow – joined by some happy local children making the most of the new facilities! Following the £50,000 makeover, children can now enjoy the new junior multi-play unit, a variety of swings, 4-way see saw, rope swing, surf rider, and trampoline. There’s new safety surfacing throughout, along with more seats and picnic benches. 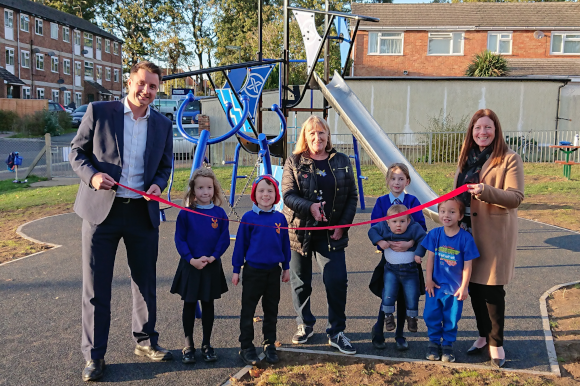 Cllr Hawkins said: “The playground has been transformed, and I hope local families enjoy using these excellent new facilities. “This refurbishment has been achieved through regular consultation with local residents, to ensure it is a fun, friendly and safe place for children to meet and play. Last year the Council agreed a Borough-wide playground improvement scheme that will see more areas of Surrey Heath benefit from improved play facilities. The play area improvement scheme is worth over £650,000, with the improvements due to be implemented over three years. 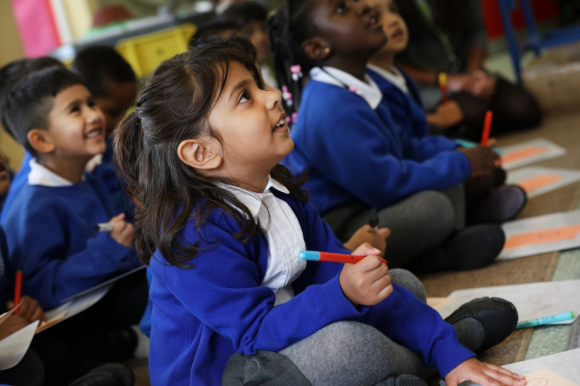 BookTrust, the UK’s largest children’s reading charity and Nicola Davies, their current Writer in Residence, have launched a poetry competition encouraging primary school age children to write a poem about nature or their local environment. One lucky winner will get a school visit from Nicola Davies and a wonderful stack of Nicola’s books for their school library. Then two runners up will each get a bundle of Nicola’s books. The winning poem, and 20 runners-up will also get their poem showcased on the BookTrust website. The competition is for pupils of a primary school age and children can take part as individuals or as a class. Their poems can be written in any style and any shape, just as long as it is about the environment. Children have until Friday 18th January 2019 to send in their poems. Full details of the competition can be found here. 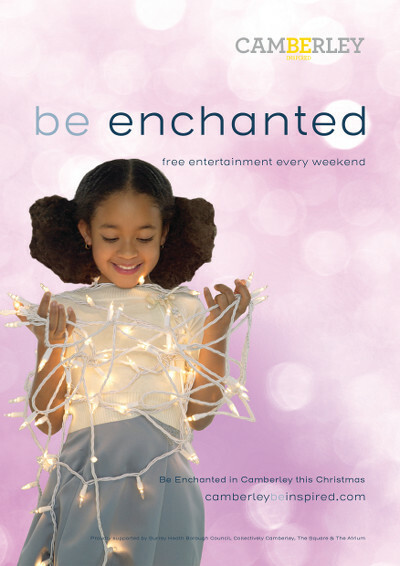 Camberley town centre is set to be a magical place this winter with an array of special events taking place every weekend through November and December until Christmas. A Nutcracker Ballet themed weekend is taking place in Cambridge Square (outside House of Fraser), The Square shopping centre on 3 and 4 November. See dance performances with dancers from Camberley’s Bluebell Ballet School. Your child will have the opportunity to take part in dance workshops to learn ballet steps and take part in the final show at 4pm. There will also be storytelling and a special craft session making mice ears. The popular Christmas lights switch event on will take place on Saturday 17 November. Join in from 10am for Camberley’s Christmas market, festive entertainment and special guests, followed by the switching on of the lights, live music and fireworks at 4.30pm, even Peppa Pig is travelling to Camberley to see this show! You can see Peppa at intervals throughout the day in The Square shopping centre. Eight unique reindeer are coming to Camberley town centre in December. The reindeer have all been decorated by local schools and nurseries and will be positioned around town, can you spot them? Pick up a form from The Square or The Atrium to record your reindeer sightings. Prizes to be won if you find them all. Get even further into the Christmas spirit with live music in The Square. During late night shopping on Thursday 13 December there will be an evening of Christmas Carols, led by the Surrey Heath Singers, before a weekend of free Christmas concerts across Saturday 15 and Sunday 16 December featuring a mixture of professional artists and local community groups. The Square and The Atrium have lots of festive fun planned too. In The Square you’ll find Father Christmas in his magical grotto, children can visit for just £4 which includes a gift. You can also join Santa for breakfast (all bookable in advance, find out more https://www.thesqcamberley.co.uk/). To coincide with Camberley Theatre’s Sleeping Beauty panto there will be Sleeping Beauty themed activities on 1 and 2 December, including dressing up and arts and crafts. You will also have the opportunity to take special Christmas photos in a snow globe on Saturday 9 December. The Atrium are running an Elf School on 8 and 9 December. Enrol and get trained up to be one of Santa’s little helpers. It's beginning to look a lot like... Christmas Lights!